White Glo Works Wonders For Whiter Teeth! I was delighted to find this fabulous Australian brand in Boots and couldn't wait to tell you all about it! I’ve used whitening toothpastes in the past and haven’t noticed too much difference. And they tend to be expensive, so I’ve never repurchased any particular brand. But this product is different. White Glo launched in the UK a couple of years back and I was recently sent a tube by More magazine – I’m part of their beauty panel, and they occasionally send us products for feedback. Until I found it in Boots I wasn't sure you could get it in Ireland, but I'm so happy you can. Honestly, this stuff is the business! From the first time I used it my teeth felt much cleaner and I started to see a difference after just a few days. 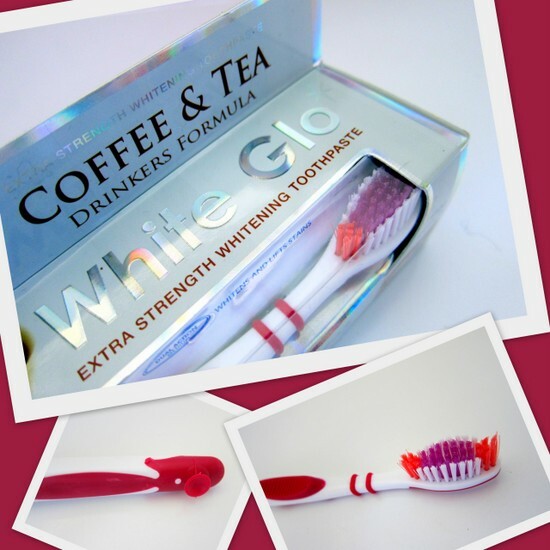 It's not too abrasive so it won't damage your teeth and it contains fluoride so will also protect against tooth decay like your normal toothpaste. Better yet, each box comes with a free anti-stain toothbrush and pack of dental flosser toothpicks - they're both brilliant! The brush has extra bristles to lift stains and a clever little suction pad so you can stick it up high and away from bacteria. And the toothpicks are really handy for popping into your bag for after meals. The brand was formulated in the early 90s for actors and models, so the story goes, and is backed by years of research and development. There are different varieties to choose from - I was sent the White Glo Professional Choice variety – the one that comes in a red box. I’ve just purchased the Coffee & Tea variety and I hope its just as effective. So all of this is well and good, but how much does it cost? Here's the great news - Boots are selling the boxes for just €4.29 each. I'd happily pay twice that much and I won't be switching from White Glo any time soon. Have you tried this? What's the best whitening toothpaste you've ever used? Tell me in the comments! Sounds like a wonder product! Sounds good- I'll be trying it out! Pearl White Drops from Boots are amazing! They do a vast selection off pastes you use after your normal one and they do work realllly well! Great post! Wow! This is awesome! I have major coffee teeth haha (luckily its not too bad but if i keep it up it will be!) I definitely want to try this!! Whitening toothpastes never work for me, I wish I could try this! I'm using Pearl Drops Hollywood Smile at the moment in an attempt to brighten my crappy teeth. It's the first time I've really used teeth whitener on a regular basis so it's good to see other options. That sounds great! Thanks for the detailed review. Now I'll have to scour nearby stores for it. I've consulted with Las Vegas dentists about teeth whitening, and this might help do the trick.